appelons qu’en 2011, la Ville de Québec invitait la population, dans le cadre du Plan de mobilité durable de la Ville de Québec, à collaborer à la réalisation de projets collectifs en matière d'aménagement et de mobilité durable. Dans ce contexte, le Comité des citoyens et citoyennes du quartier Saint-Sauveur et le Conseil de quartier de Saint-Sauveur ont élaboré de 2011 à 2016 le premier plan de mobilité durable de quartier sur le territoire de la Ville de Québec. Au total, ce sont plus de 2500 heures de bénévolat et d'implication citoyenne qui ont été enregistrées lors des différentes activités. Snapchat says it reaches 28.5 to 30 million 18-24 year old users in the U.S. According to a recent survey of Instagram users, approximately 32 percent of its 1 billion-strong user base is 18-24. Snapchat reaches around 30 million 18-24 year old users; important ages that are more recently able to vote and take political action. Instagram and snapchat are most popular amongst younger users. Explore development of Anthropocence. How do we track progression of Anthropocene? CO2 Emissions?? 66,000 Russians living in Eastern Siberia as opposed to the 247,000 in the west. This proportion would not change for the next 200 years, despite the large increase in populations in Siberia. In 1897, the huge eastern territory had a population of 909,000 Russian inhabitants, while the west had three times more. Forsyth, James. A history of the peoples of Siberia: Russia's north Asian colony, 1581-1990. Cambridge: Cambridge Univ. Press, 1992. 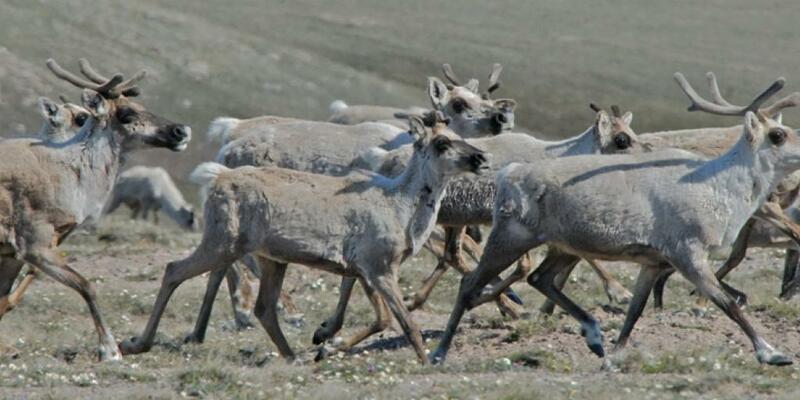 The Porcupine caribou herd is one of the largest migratory barren-ground caribou herds found in North America. The range of the herd spans over 250,000 square kilometers in the northern tundra. In the spring, the herd migrates between Alaska and Yukon’s arctic coast. In the winter, the herd ventures into Yukon’s Ogilvie Mountains. Although the majority of the land in the range of the herd is undeveloped, there are certain key areas which have been industrialized. Oil and gas exploration in the Eagle Plains basin interrupts the winter range of the Porcupine caribou herd. Also affecting the herd’s winter range are the Dempster Highway and mineral exploration in the Peel River watershed. The Dempster Highway connects Inuvik to Dawson City (Porcupine Caribou Management Board). Regarding population size of the Porcupine caribou herd, according to the Arctic journal, “migratory wild reindeer and caribou numbers have dropped by about one-third since populations peaked in the 1990s and early 2000s”. There are natural periods of abundance and scarcity among migratory tundra caribou herds. These increases and decreases in population size are likely results of “continental climate switches” (Gunn et al. 2009, iii). Since the first population survey in the early 1970s, the Porcupine Caribou Management Board has conducted a survey every two years and reports that the population size has fluctuated between 100,000 and 200,000 animals (Porcupine Caribou Management Board). 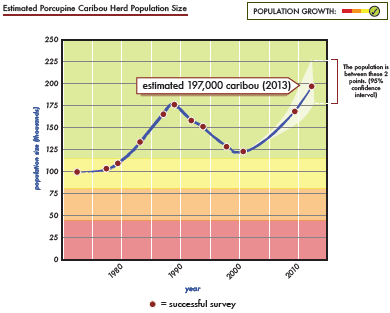 A detailed graph estimating the size of the population of the Porcupine caribou herd is shown below. For further information, please consider the following link to The Porcupine Caribou Management Board (PCMB) webpage: http://www.pcmb.ca/. Gunn, Anne, Don Russell, Robert G. White, and Gary Kofinas. "Facing a Future of Change: Wild Migratory Caribou and Reindeer." Arctic 62, no. 3 (2009): Iii-Vi. http://www.jstor.org/stable/40513303. Porcupine Caribou Management Board. "The Porcupine Caribou Management Board (PCMB)." Porcupine Caribou Management Board. Accessed March 08, 2017. http://www.pcmb.ca/. The Canadian Wildlife Service organization was originally founded under the name of the Dominion Wildlife Service in November 1947. There were about thirty staff members of the organization at this time. In 1950, the organization’s name was changed to its current title of the Canadian Wildlife Service. The three main focuses of the Canadian Wildlife Service have been and continue to be the management of migratory birds, the management of game and furbearing mammals, and the enforcement of international treaties to ensure conservation of species. In order to accomplish these tasks, the Canadian Wildlife Service has conducted extensive research regarding population, population ecology, survival factors, migration patterns, limnological studies, environmental toxicology, and endangered species evaluation and protection of several species of the Arctic. Examples of these species include elk, moose, bison, caribou, muskoxen, polar bears, wolves, arctic foxes, geese, ducks, songbirds, seabirds, trumpeter swans, whooping cranes, and peregrine falcons. Additionally, the Canadian Wildlife Service has been tasked with the management of National Parks and the creation of public education programs (Burnett et al. 1999). During the 1970s, the Canadian Wildlife Service researched and reported on the reproductive success of the black-crowned night heron on Pigeon Island of Lake Ontario (Price 1978), biology of the Kaminuriak population of barren-ground caribou (Arctic 1977), hunting of and attacks by polar bears along the Manitoba coast of Hudson Bay (Jonkel et al. 1976), biology and management of bears (Bears: Their Biology and Management 1976), and many other environmental and biological concerns regarding the wildlife of the Arctic. Additional information and the current contact information of the Canadian Wildlife Service can be found at: https://www.ec.gc.ca/paom-itmb/default.asp?lang=En&n=5f569149-1. "Books Received." Arctic 30, no. 1 (1977): 67-68.<br> http://www.jstor.org/stable/40508780. Burnett, J. A., and Canadian Wildlife Service. 1999. A Passion for Wildlife: A History of the Canadian Wildlife Service, 1947-1997 and Selected Publications from Work by the Canadian Wildlife Service. Canadian field-naturalist, v. 113, no. 1; Canadian field-naturalist, v. 113, no. 1. Jonkel, Charles, Ian Stirling, and Richard Robertson. "The Popular Bears of Cape Churchill." Bears: Their Biology and Management 3 (1976): 301-02. doi:10.2307/3872777. "Preface." Bears: Their Biology and Management 3 (1976): 7. http://www.jstor.org/stable/3872749. Price, Iola. "Black-Crowned Night Heron Reproductive Success on Pigeon Island, Lake Ontario 1972- 1977 (Abstract Only)." Proceedings of the Colonial Waterbird Group 1 (1978): 166. doi:10.2307/1520916. Most Salvadorans are Christian. About 57 percent of the population identifies with the Roman Catholic Church, and much of the remainder is Protestant. What are the other religions in El Salvador? And how do they celebrate there religion? Like what are there traditions? This is about 1/3 of the population for the entire country. Thats a lot of people in one place at one time for a country that small. The average population density is approximately 299 persons per square kilometer (774 per square mile). This means that El Salvador is clearly a small country, because if there is about 6 million people for the population, and there is 774 people per square mile, the amount of land is small. As shown in an example earlier, in which Holmes references a book for descriptions of various nationalities, this quote is another example of Doyle giving an idea of the diversity in London at this time. As also explained in the article I have attached, while many different nationalities had migrated to London at this time very few were of different appearance. Should nonviolent drug offendersbe sent to prison? Sub-question and division in the topic. Also specifies a particular population in the issue. Maybe you wish to focus only on nonviolent drug offenses. n order to obtain an accurate estimate of true completion, and thus population, one must bias-correct the observed re-detection ratio to estimate the true completion as a function of size of asteroid. We do this with a computer model simulating actual surveys.